What do I do all day? I work for an advertising agency! Basically just picture Don Draper but less sexist and much healthier and that’s me. Just kidding! I manage online marketing and advertising campaigns for brands looking to generate leads, sales and increased brand awareness for their companies. I usually work with medium sized companies, but sometimes I get to work with famous bloggers and semi-celebrities. I’m the head or director of my department within the agency, but we’re a small team, so I wear many hats. A typical day for me consists of a balance between writing strategy and executing it. Boiled down, you could say I put together ads and crunch numbers to make sure the ads are delivering a return-on-investment for my clients. One of my absolute favorite things to do occurs every time I put together a new online advertising campaign: I create an a/b test! An a/b test consists of pitting two ads against each other and seeing which one performs better with the target audience. 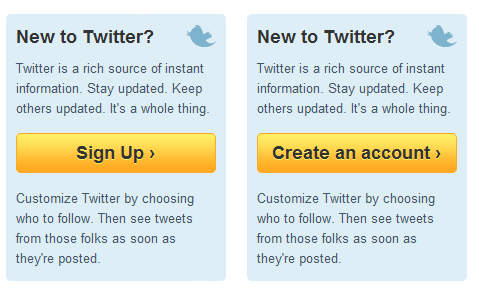 Twitter a/b tested whether the copy “Sign Up” or “Create an account” on the button would generate more new users for them. Most of the a/b tests I could to execute are a bit more complex than that. For example, one client of mine is in the retail pet industry. 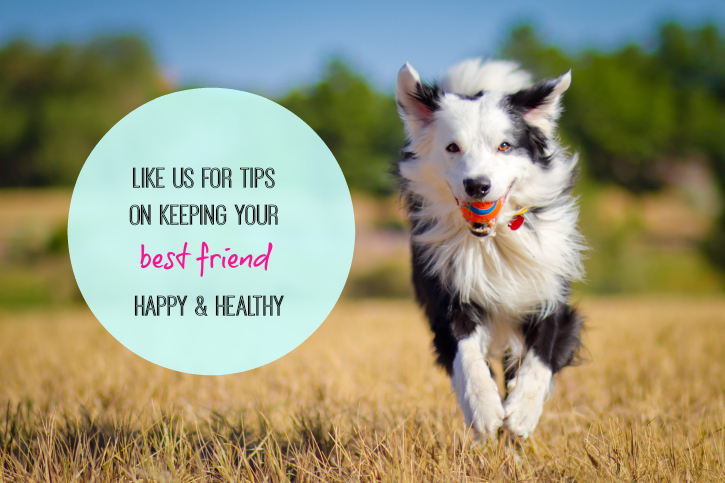 One of their goals is to build trust and credibility with pet parents, and as such they share helpful tips and information about pet care via their blog and Facebook page. To build up their brand awareness we run community growth ad campaigns on Facebook — you know those ads you see in your Newsfeed that are about topics you’re interested in but perhaps not from brands you’re already aware of. When I am putting together a community growth ad campaign I don’t just arbitrarily choose any old picture and pair it with a sentence I thought up on the fly. 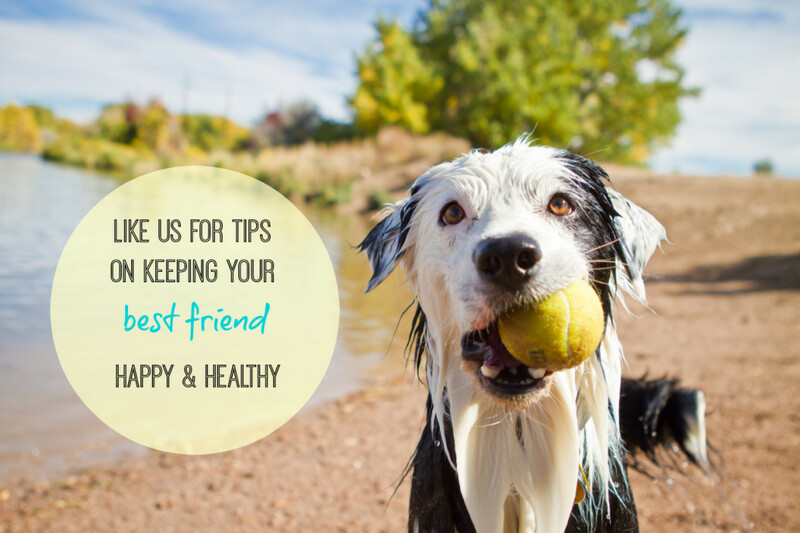 Instead I carefully select two or more images that I think will resonate with the audience, in this case affluent pet parents, and I write several different lines of copy for the ads. I then test all possible image + copy combinations against each other to see which one delivers the best results — in this case the most Likes on Facebook. And let’s say image #2 achieved the best results … I would then start creating varieties of that ad to see if I could improve the results even further. You would be surprised at what a difference something like the color of the bubble could make. I can tell you that one of these colored bubbles outperformed the other one by 20X!! After I find out which color performs the best, I might try a different color or change the copy and see if that makes a difference…. and the testing continues on until I reach a plateau. After I hit the plateau I’ll start over again with a new image and the process continues! My job is basically all about writing hypotheses and then testing them out. I hypothesized that the ad with the yellow bubble would generate better results than the blue bubble because the color is more eye-catching. After running the test to statistical relevance I discovered that I was correct OR I was wrong and I believe that is because _____ so I am going to test ______ next. I love a/b testing because it iso closely ties creativity with data. It’s such a great balance for someone like me who loves both sides of the marketing world! 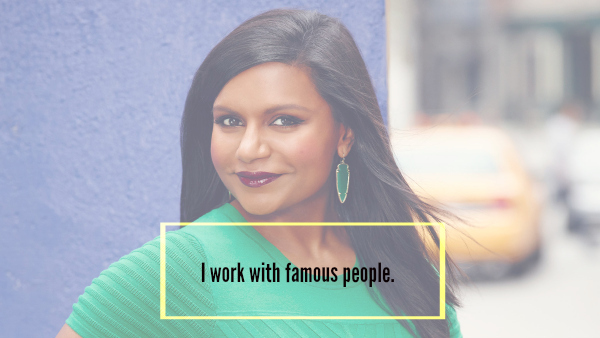 Sometimes I work with semi-famous people like bloggers/vloggers, former professional athletes and other ‘celebrities’ to take their personal brands to the next level. That’s always interesting and I could probably write a small book about what it’s is like! I think I better save that for another day though as this post is already getting quite long! It can be hard for me to separate this blog from work — there are SO many things I could do for The Bar (Blog About Running) that I don’t because this blog is for FUN not my job! I try to keep things as simple as possible here so that it remains a hobby. I hope I didn’t bore you too much with the dirty details of my job! Any fellow marketers out there? Yes! I think that is the best part of my job, I’m always getting to try something new on behalf of my clients! Your job sounds really fun! Kids are so creative, I love how they can take super simple things that adults see as *just* a chair and a blanket and re-imagine them into castles and forts! Sounds like you enjoy your work! That is something a lot of people have a hard time doing. I am the Service Manager for the largest RV component manufacturer in the world. Yay for large corporations!! I love my job! I am busy speaking with customers, directing my employees on what needs done (where and when), keeping track of all work performed etc. I also only have males that work for me so being able to tell guys what to do all day long everyday is fun too!! 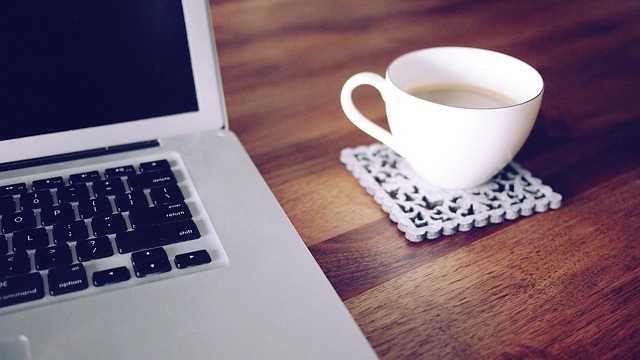 Working in a field that incorporates blogging as a marketing tactic is really interesting. The process for putting together a blog post for a client and a blog post for my running blog is SO different. I think that’s why I’m able to blog here almost every night and not think about it as work! Oh man, I WISH! I bet he would be so fun to work with! A/B testing is seriously so fun, it’s hands down the best part of my job! I had to Google what an actuary is, what an interesting job! What kind of an engineer were you prior to your new job? And PS: CONGRATS on starting the new gig! I LOVE hearing about this stuff! Did the ad with the yellow bubble really do better? Because that’s the one I like the best. Now, who do you test this stuff on? Do you have a bunch of people you send it to as like a test audience? Also, when I am rich enough to higher a marketing team, I would like Jelly to become a very famous cat model and I would like YOU to make that happen! I think he needs to be in commercials, on food bags, and memes. I want him to be BIGGER THAN GRUMPY CAT. Much to my surprise the yellow bubble did NOT win! I really thought it would because the color stands out so much more which draws your eye to the call to action. However, most Americans (male and female) list blue as their favorite color so I suppose it’s not totally crazy that blue won. We sometimes conduct focus groups for certain ideas or products, but with online ads we just run both ads in real time to the same targeted audience and see which one generates the best response. 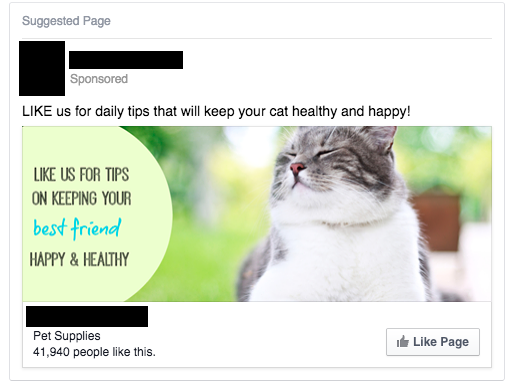 So, anytime you see an ad on Facebook there is (probably) someone else with the same demographics/interests as you seeing a different variation of it at the same exact time. Once we receive enough responses for the data to be statistically relevant we deem a test winner and start the next round of testing. I really think I could help you with Jelly. I actually have worked with two famous cats, haha! Really!? Your job sounds so cool. When people say they are in marketing, I don’t really know what that means. Now I have a better idea. There are so many different areas under the marketing umbrella — my little slice of the world is online marketing (which is the best slice, in my opinion!). Within the agency I work for there are other departments that focus on specific things like websites and landing pages, photoshoots, video production, catalogs, billboards, etc. I actually work in digital marketing (specifically SEO with a focus on content creation), so I’m happy to see your post on this 🙂 And we’re even setting up some A/B testing for a client’s website over the next week or so! I feel similarly. I haven’t had much time to blog the last couple of weeks and I’ve been feeling a little blue (combination of it being dark out earlier, feeling frustrated about running and non-running things, and some potential big changes on the horizon). I also haven’t optimized even a little bit of my blog. When I’m doing it all day long for work, it just feels nice to blog without expectation or concern. I don’t tweet out my posts multiple times a day like I did for my old personal blog. I just want to keep it easy and comment when I feel like I legitimately have something to comment on, share what I legitimately want to share, etc. It’s cool to hear what you do outside of the blog world, and it sounds like you really love your job! I am lucky to job that is really rewarding. Some of our clients have been with the agency for 20+ years and while I didn’t have a direct hand in helping them grow since I’ve only been with the company for 2.5 years, it’s cool to know that the agency has helped companies go from small startups to multi-million dollar companies and have positioned them as leaders in their industries! That is really interesting! I actually love hearing about jobs that are totally different than mine and hearing about what is done day to day. My full time job is at an elementary school. I’m a mental health therapist for students with emotional/behavioral difficulties. I also wear MANY hats! I always come home from work with some sort of crazy story about my day! It is really challenging but I love it, and I love that blogging and running are so different than my full time work. Wow, I can only imagine how many hats you have to wear in a day. I’m sure you can’t share online, but if we ever meet in person I would totally want to hear some of your stories! It’s a TV show that is watched mainly by men who like doing things outdoors! I love hearing about what people actually do! It’s easy to say “I’m a teacher,” “I’m an accountant,” etc…but I really have no idea what anyone does all day unless they explain it. I’ve only ever had jobs in pharmacies or hospitals, so I know nothing about careers outside of health care. I’m a pharmacist, so I give out drugs, help people with their medications, give flu shots…fun stuff like that. You have such an important job! Do people get squeamish about their flu shots? I’ve never gotten one because I am a chicken! Luckily I’ve never gotten the flu! Sometimes adults pretend to be really scared just to be silly, but that’s about it. I think those who are truly squeamish avoid the shots altogether. Holy crap this was awesome lol. When I hear Advertising it reminds me of Mel Gibson in What Women Want :). But it’s such an interesting profession and it has to be exciting just about every day. Let me know when you start your own agency lol. I’ve never seen What Women Want, I didn’t realize it had to due with advertising. I hope they have it in Netflix so I can watch it this weekend! I work at a car dealership as a receptionist soo not as exciting. lol. YES! It’s always so interesting to see what people respond to. I love when my hypothesis is proven wrong because I learn so much more that way! I could see working at a car dealership being fun — your customers should all be really happy since they are getting new (or new to them) cars! I LOVED this!! I already knew that you were brilliant and a hard worker but this sort of blew me away. Your job sounds fun and perfect for you – I love to hear people talk about their job with so much enthusiasm and excitement. Just reading I could tell that you love what you do!! I hope you share more – fun to see how some of the processes behind the final product work. Kim, I do feel really lucky to work in a field that I enjoy. I originally worked in public relations but quickly learned that is NOT for me! Luckily the crossover to marketing was pretty seamless thanks to an awesome mentor I was/am really lucky to have. I think I will write up another post soon about what it’s like to work with ‘famous’ personalities, I think that could be make for an interesting post! Very cool! It’s always interesting to get a “slice of life” about what someone’s day-to-day job is really like, especially in an industry I know nothing about. Love the “insider” perspective! It was especially interesting about how something as simple as the color of the ad can affect the clicks. It’s fascinating – and a little unsettling – how predictable we are and how easily we can be manipulated by advertising! It is kind of crazy how simple things can impact an ads performance. For example, the way someone is standing in an ad affects how your eye takes in the message. If the person in the ad is looking at or angled towards the copy in the ad, your eye will be drawn to the copy faster than if the person was looking away from the copy! OF COURSE! 🙂 Provided I didn’t first die from happiness that is! This sounds like a blast!! It’s really cool to see behind the scenes like this. It’s odd how we know that a billion different jobs must exist out there to choose from, but we never really know what other options there are…Like, I could never imagine what I might do if I didn’t teach, but I’d never even thought about ad development the way you do it! There are other aspects of my current job that I am a fan of but when I get to do the things I love it makes my entire week! That is really awesome! Your job must be really hard but super rewarding. I am surprised you run before work! I would probably need to run afterwards to clear my mind! As a psychologist, I would love your job. When I was getting my PhD, I thought about doing marketing and advertising before I landed my current position. If I were not doing what I am doing now, I would definitely pursue a career in marketing. My husband actually owns an advising and PR firm here in town, so our interests overlap a lot. I am always throwing out ideas and showing him research that I come across, especially when I teach my social psychology courses. I would totally geek out on the A/B testing and think I should fly to Florida so I can job shadow you for a day. 🙂 And so we can run together. And because it’s Florida. Yes! Come visit! I would love to get your insight while choosing images and copy for testing purposes!